Thinking something festive with green, red, and white colors then I came out with this idea to make Happy Soda Drink. We can easily get what we call 'Soda Gembira' drink available at most restaurants here. The ingredients are only soda water and sweet condensed milk with lot of ices. 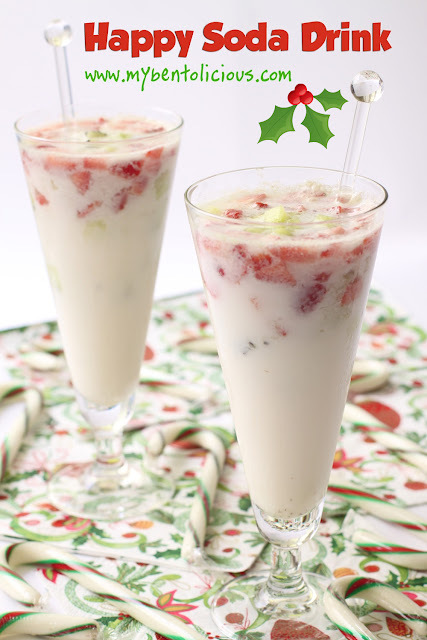 And for this is Christmas month, I love to add kiwi fruits and strawberries inside the drink. Easy to make and it's quite tasty cold drink. 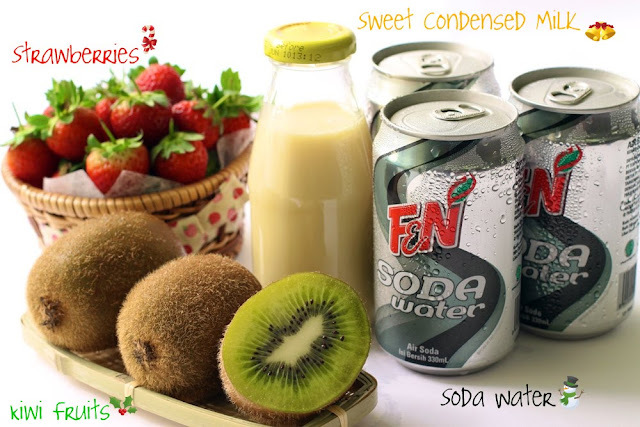 The sweet taste is from the sweet condensed milk, add with sparkling of soda water and freshness of kiwi fruits + strawberries just make this drink wonderful ... well at least for me. (1) Diced strawberries and kiwi fruits. (2) Pour sweet condensed milk until 1/5 of the glass. (3) Add soda water until 3/5 of the glass. (4) Then add diced strawberries and kiwi fruits until 4/5 of the glass. (5) Stir well until the all ingredients mixed perfectly. (6) Add some ices and ready to drink. Yummy! Delicious, beautiful, and so festive! It's freezing here too... but still I would love to try your delicious and refreshing looking drink! Making me thirsty right now, in fact..and I like your group shot of the ingredients...we don't have the can called "soda water" but it's probably like "club soda", which just adds the bubbles, right? Lovely, Lia! Ya, I had 7-up and milk b4, very yum & refreshing, but ur version is superb, looks colorful & festive! happy sodaa!! one of my favourite drinks!! especilally on a hot sunny day.. by the way the soda does look as happy as the name "happy soda"
This is a nice Christmas drink, can deeply feel the Chirstmas with looking at the drink...hehe.. This looks so refreshing! Excellent recipe--I'm excited to try! As always am impressed by your beautifully produced posts, Lia! wonderful photos and quite festive too...loved it! @Nostalgia : Thanks a lot for your comment and thanks to visit my blog. How pretty is this! I remember when mom used to put condensed milk in my soda as a treat. The addition of fruit is such a neat idea. i must try this with my kids. Just the right colors for Xmas! WOW! Very healthy and refreshing. Anymore left?? @Anncoo : For you, I will make more anytime hehehe ... Thanks Anncoo! @Indah Sarah : Thanks a lot Indah!